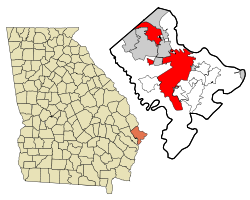 Savannah (/səˈvænə/) is the oldest city in the U.S. state of Georgia and is the county seat of Chatham County. Established in 1733 on the Savannah River, the city of Savannah became the British colonial capital of the Province of Georgia and later the first state capital of Georgia. A strategic port city in the American Revolution and during the American Civil War, Savannah is today an industrial center and an important Atlantic seaport. 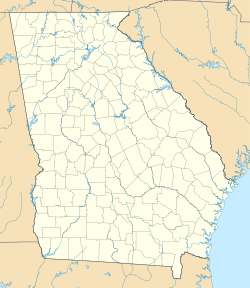 It is Georgia's fifth-largest city, with a 2017 estimated population of 146,444. The Savannah metropolitan area, Georgia's third-largest, had an estimated population of 389,494 in 2018. Each year Savannah attracts millions of visitors to its cobblestone streets, parks, and notable historic buildings: the birthplace of Juliette Gordon Low (founder of the Girl Scouts of the USA), the Georgia Historical Society (the oldest continually operating historical society in the South), the Telfair Academy of Arts and Sciences (one of the South's first public museums), the First African Baptist Church (one of the oldest African-American Baptist congregations in the United States), Temple Mickve Israel (the third-oldest synagogue in America), and the Central of Georgia Railway roundhouse complex (the oldest standing antebellum rail facility in America). Savannah, a prosperous seaport throughout the nineteenth century, was the Confederacy's sixth most populous city and the prime objective of General William T. Sherman's March to the Sea. Early on December 21, 1864, local authorities negotiated a peaceful surrender to save Savannah from destruction, and Union troops marched into the city at dawn. Savannah lies on the Savannah River, approximately 20 mi (32 km) upriver from the Atlantic Ocean. 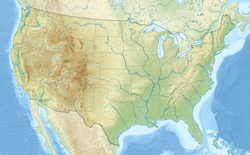 According to the United States Census Bureau (2011), the city has a total area of 108.7 square miles (281.5 km2), of which 103.1 square miles (267.0 km2) is land and 5.6 square miles (15 km2) is water (5.15%). Savannah is the primary port on the Savannah River and the largest port in the state of Georgia. It is also located near the U.S. Intracoastal Waterway. Georgia's Ogeechee River flows toward the Atlantic Ocean some 16 miles (26 km) south of downtown Savannah, and forms the southern city limit. Savannah's climate is classified as humid subtropical (Köppen Cfa). In the Deep South, this is characterized by long and almost tropical summers and short, mild winters. Savannah records few days of freezing temperatures each year (and has rare snowfall). Due to its proximity to the Atlantic coast, Savannah rarely experiences temperatures as extreme as those in Georgia's interior. Nevertheless, the extreme temperatures have officially ranged from 105 °F (41 °C), on July 20, 1986, down to 3 °F (−16 °C) during the January 1985 Arctic outbreak. Seasonally, Savannah tends to have hot and humid summers with frequent (but brief) thunderstorms that develop in the warm and tropical air masses, which are common. Although summers in Savannah are frequently sunny, half of Savannah's annual precipitation falls during the months of June through September. Average dewpoints in summer range from 67.8 to 71.6 °F (20 to 22 °C). Winters in Savannah are mild and sunny with average daily high temperatures close to 60 °F (16 °C). November and December are the driest months recorded at Savannah–Hilton Head International Airport. Each year, Savannah reports 24 days on average with low temperatures below freezing, though in some years fewer than 10 nights will fall below freezing. Although decades might pass between snowfall events, Savannah has experienced snow on rare occasions, most notably in December 1989, when up to 3.9 inches were recorded in one day in parts of the city. According to the U.S. Census Bureau, Savannah's 2017 estimated population was 146,444, up from the official 2010 count of 136,286 residents. The Census Bureau's 2018 estimated population of the Savannah metropolitan area, defined by the Census Bureau as Bryan, Chatham, and Effingham counties, was 389,494. Between 2000 and 2010, Savannah's metro area had grown from 293,000 to 347,611, an increase of 18.6 percent. Savannah is also the largest principal city of the Savannah-Hinesville-Statesboro Combined Statistical Area, a larger trading area that includes the Savannah and Hinesville metropolitan areas and (since 2012) the Statesboro Micropolitan Statistical Area. The 2018 estimated population of this area was 547,285, up from 495,745 at the 2010 Census. In 2009-2017, Savannah was North America's fourth largest port for shipping container traffic. Savannah Ballet Theatre – established in 1998 as a nonprofit organization, it has grown to become the city's largest dance company. Savannah's historic district has 22 squares (Ellis Square, demolished in 1954, was fully restored in early 2010). The squares vary in size and character, from the formal fountain and monuments of the largest, Johnson, to the playgrounds of the smallest, Crawford. Elbert, Ellis, and Liberty Squares are classified as the three "lost squares," destroyed in the course of urban development during the 1950s. Elbert and Liberty Squares were paved over to make way for a realignment of U.S. highway 17, while Ellis Square was demolished to build the City Market parking garage. The city restored Ellis Square after razing the City Market parking garage. The garage has been rebuilt as an underground facility, the Whitaker Street Parking Garage, and it opened in January 2009. The newly restored Ellis Square opened in March 2010. Separate efforts are now under way to revive Elbert and Liberty Squares. 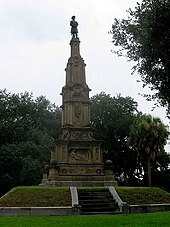 Franklin Square is the site of Savannah's Haitian Monument, which commemorates the heroic efforts of the Chasseurs-Volontaires de Saint-Domingue in the 1779 Siege of Savannah and for an independent America. One of the few black regiments to fight for the American side in the Revolutionary War, the soldiers were recruited from present-day Haiti, until 1804 the French colony of Saint-Domingue. Among the historic homes that have been preserved are: the Olde Pink House, the Sorrel-Weed House, Juliette Gordon Low's birthplace, the Davenport House Museum, the Green-Meldrim House, the Owens-Thomas House, the William Scarbrough House, and the Wormsloe plantation of Noble Jones. The Mercer-Williams House, the former home of Jim Williams, is the main location of Midnight in the Garden of Good and Evil. City Market – Savannah's restored central market and popular nightlife destination features antiques, souvenirs, small eateries, as well as two large outdoor plazas. Savannah hosts four colleges and universities offering bachelor's, master's, and professional or doctoral degree programs: Georgia Southern University-Armstrong Campus, Savannah College of Art and Design (SCAD), Savannah State University, and South University. In addition, Georgia Tech Savannah offers certificate programs, and Georgia Southern University has a satellite campus in the downtown area. Savannah Technical College, a two-year technical institution and the Skidaway Institute of Oceanography, a marine science research institute of the University of Georgia located on the northern end of Skidaway Island, offer educational programs as well. Savannah is also the location of Ralston College, a liberal arts college founded in 2010. The Savannah Morning News is Savannah's only daily newspaper. The Savannah Tribune and the Savannah Herald are weekly newspapers with a focus on Savannah's African American community. Connect Savannah is an alternative free weekly newspaper focused on local news, culture and music. The Coastal Buzz is the metro area's only media company dedicated to "positive news." It is owned by Positive Life Media. ^ a b c d "2017 U.S. Census Estimates–List of Places". U.S. Census Bureau. Retrieved May 24, 2018. ^ a b c d "Savannah". New Georgia Encyclopedia. Georgia Humanities Council and the University of Georgia Press. September 11, 2006. Retrieved January 1, 2008. ^ "Savannah Information". Savannah Area Convention & Visitors Bureau. Archived from the original on January 2, 2008. Retrieved January 1, 2008. ^ "Siege of Savannah During the American Revolutionary War". History Net: Where History Comes Alive - World & US History Online. Retrieved October 1, 2014. ^ "Part 1: Visit to Savannah". Georgiainfo.galileo.usg.edu. April 29, 1996. Archived from the original on December 15, 2012. Retrieved December 29, 2012. ^ "Stormwater Management | Savannah, GA - Official Website". www.savannahga.gov. Retrieved January 29, 2019. ^ "NowData - NOAA Online Weather Data". National Oceanic and Atmospheric Administration. Retrieved February 27, 2012. ^ Mobley, Chuck. "Hurricane David, 30 years after the storm". Savannah Morning News. Retrieved January 29, 2019. ^ "Hurricane Matthew Review from Savannahpat.name ... Observations from Patrick Prokop". www.savannahpat.name. Retrieved January 29, 2019. ^ Ray, Brittini. "Hurricane Matthew One Year Later: Storm anxiety has residents asking 'Is it all worth it?'". Savannah Morning News. Retrieved May 17, 2018. ^ "Savannah walloped, Tybee Island swamped by Irma". ajc. Retrieved May 17, 2018. ^ LaBrot, Amanda. "Chatham County receives millions in Hurricane Matthew reimbursement". Retrieved May 17, 2018. ^ "NowData - NOAA Online Weather Data". National Oceanic and Atmospheric Administration. Retrieved September 5, 2016. ^ "GA Savannah INTL AP". National Oceanic and Atmospheric Administration. Retrieved September 5, 2016. ^ "WMO Climate Normals for SAVANNAH/MUNICIPAL, GA 1961–1990". National Oceanic and Atmospheric Administration. Retrieved September 5, 2016. ^ "Weather History for Savannah, GA [Georgia] for January". Weather-warehouse.com. Retrieved October 1, 2014. ^ Roger Beall. "Chatham County-Savannah Metropolitan Planning Commission". Thempc.org. Archived from the original on April 26, 2012. Retrieved July 1, 2012. ^ "Census of Population and Housing". Census.gov. Archived from the original on May 12, 2015. Retrieved May 20, 2016. ^ Bureau, U.S. Census. "American FactFinder - Results". factfinder.census.gov. Retrieved March 23, 2018. ^ "Race and Hispanic Origin for Selected Cities and Other Places: Earliest Census to 1990". U.S. Census Bureau. Archived from the original on August 6, 2012. Retrieved April 22, 2012. ^ a b "City Government". City of Savannah. Archived from the original on April 22, 2010. Retrieved May 24, 2010. ^ "City of Savannah Neighborhoods 2008" (PDF). City of Savannah. Archived from the original (PDF) on September 27, 2011. Retrieved September 15, 2010. ^ "Coastal State Prison". Georgia Department of Corrections. Archived from the original on September 4, 2010. Retrieved September 15, 2010. ^ "Agriculture in Georgia: Overview". The New Georgia Encyclopedia. Retrieved November 16, 2007. ^ "North American Container Traffic" (PDF). CMS Plus. Retrieved August 24, 2011. ^ "Top 20: U.S. Ports Ranked on 2017 Import Volume". The Maritime Executive. Retrieved January 29, 2019. ^ "Savannah Book Festival". Savannahbookfestival.org. Retrieved October 1, 2014. ^ "Flannery O'Connor Childhood Home". Flanneryoconnorhome.org. Retrieved October 1, 2014. ^ "Savannah Ballet Theatre". Savannahballettheatre.org. Retrieved October 1, 2014. ^ "The Coastal Jazz Association". Coastal-jazz.org. Retrieved October 1, 2014. ^ "Savannah Children's Choir". Savannahchoir.org. Retrieved October 1, 2014. ^ "Savannah Concert Association". Savannahconcertassociation.com. Retrieved October 1, 2014. ^ "The Savannah Orchestra". Archived from the original on December 18, 2014. ^ "The Savannah Philharmonic". 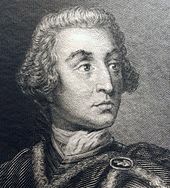 Savannahphilharmonic.org. Retrieved October 1, 2014. ^ "The Savannah Winds". Finearts.armstrong.edu. Retrieved October 1, 2014. ^ "The Armstrong Atlantic Youth Orchestra". Savaayo.org. Retrieved December 29, 2012. ^ "Muse Arts Warehouse". Musesavannah.org. Retrieved October 1, 2014. ^ "Savannah Children's Theatre". Savannahchildrenstheatre.org. Retrieved October 1, 2014. ^ "Savannah Community Theatre". Savannahcommunitytheatre.com. Retrieved October 1, 2014. ^ "Little Theatre of Savannah". Littletheatreofsavannah.org. Retrieved October 1, 2014. ^ "Savannah Theatre". Savannahtheatre.com. Retrieved October 1, 2014. ^ "Odd Lot Improv". oddlotproductions.com. Retrieved August 5, 2016. ^ "Security Check Required". www.facebook.com. Retrieved October 27, 2017. ^ "City of Savannah Home Page". Archived from the original on October 28, 2012. ^ "About Savannah". City of Savannah. Archived from the original on March 4, 2011. ^ "Savannah, the Forest City". N-georgia.com. Retrieved October 1, 2014. ^ "Visit Savannah". Savannah Convention & Visitors Bureau. Retrieved October 16, 2015. ^ "America's Favorite Cities 2011 - Quality of Life and Visitor Experience | Travel + Leisure". Travelandleisure.com. Archived from the original on July 2, 2012. Retrieved July 1, 2012. ^ "America's Favorite Cities 2011 - Savannah | Travel + Leisure". Travelandleisure.com. Archived from the original on June 19, 2012. Retrieved July 1, 2012. ^ "America's Favorite Cities 2011 - Quality of Life and Visitor Experience - Architecture/Cool buildings | Travel + Leisure". Travelandleisure.com. Archived from the original on June 29, 2012. Retrieved July 1, 2012. ^ "Tour Savannah's Squares". Archived from the original on October 9, 2007. Retrieved November 16, 2007. ^ "Squares of Savannah". Retrieved July 15, 2009. ^ a b "First African Baptist Church of Savannah". PBS. Retrieved January 29, 2009. ^ "Savannah City Market - Savannah, GA - Shopping, Dining, Art, Nightlife, Events". City Market. Retrieved April 28, 2018. ^ "Georgia Historical Markers". University of Georgia Carl Vinson Institute of Government. 2006. Archived from the original on April 10, 2007. Retrieved May 4, 2007. ^ "National Register of Historic Places". Archived from the original on April 26, 2007. Retrieved May 4, 2007. ^ "Club One". Clubone-online.com. Retrieved October 1, 2014. ^ "Ralston College". Ralston.ac. Retrieved October 1, 2014. ^ "Accreditation". Savannahlawschool.org. Retrieved October 1, 2014. ^ Peebles, Will. "Savannah Law School to close after spring semester". Savannah Morning News. Retrieved May 17, 2018. ^ "Connect Savannah website". Connectsavannah.com. Retrieved October 1, 2014. ^ "Mondo Times entry on Connect Savannah". Mondotimes.com. Retrieved October 1, 2014. ^ a b "Your Savannah Resource for Downtown Transportation". Retrieved November 18, 2008. ^ "City of Savannah Town Hall Report 02/08" (PDF). City of Savannah. Archived from the original (PDF) on March 25, 2009. Retrieved June 21, 2009. ^ Sarkissian, Arek (February 4, 2009). "Burglaries soar in '08 for metro Savannah". Savannahnow.com. Savannah Morning News and Evening Press. Archived from the original on July 18, 2012. Retrieved February 4, 2009. ^ Sarkissian, Arek. "2010-01-22". Savannahnow.com. Savannah Morning News and Evening Press. Retrieved May 24, 2010. 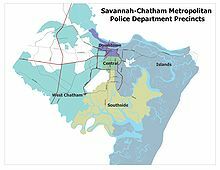 ^ "Savannah-Chatham Metropolitan Police Department". July 1, 2012. Archived from the original on July 1, 2012. ^ "SCMPD addresses violent crime concerns". www.wtoc.com. Retrieved December 17, 2015. ^ Evans, Sean. "Crime trending downward in City of Savannah". Retrieved May 17, 2018. ^ "Sister City US Listings – Directory Search Results". Sister Cities International. Archived from the original on March 29, 2010. Retrieved July 7, 2010. ^ "Batumi - Twin Towns & Sister Cities". Batumi City Hall. Archived from the original on May 4, 2012. Retrieved August 10, 2013. "Savannah" . The American Cyclopædia. 1879.